Although the weather does not quite feel like spring, it’s not too early to get working on your patio. 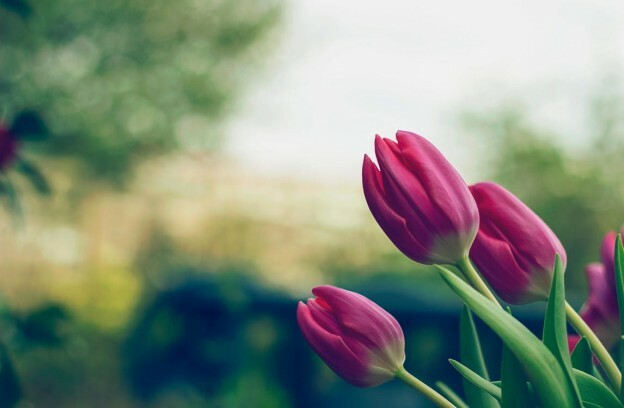 Spending quality time outdoors is often a cure for whatever ails you (this summer it may be the never-ending gloomy weather). These ideas are guaranteed to help perk up your patio before the summer weather arrives. Power Clean: Work with the professional team at Fortune Restoration to remove loose paint, mold, grime, dust, mud, and dirt on your brickwork, siding, and deck. This will leave you a clean surface to work with. 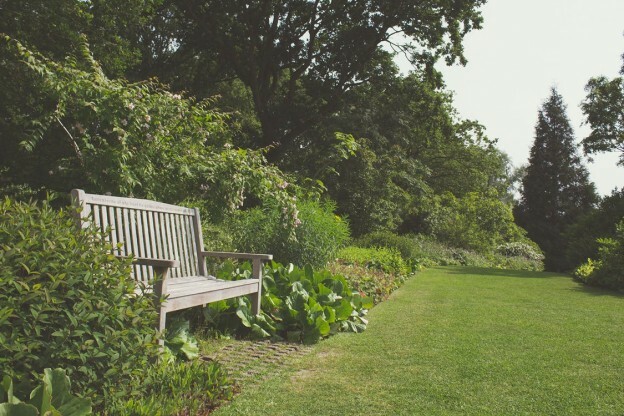 Garden Bench: Tuck away a garden out of sight that is sheltered by a shaded area. Make it cozy with soft pillows and potted plants. This is a perfect spot to relax and read. Tall Garden Containers: Scatter tall garden containers with spiked bright flowers to add some color to your patio. Choose black and white pots to make the flowers more eye-catching. Make A Good First Impression: Greet your guests with a doormat in a vibrant pattern or fun saying. Brighten Up Your Paint: Faded, chipped, and dull paint is boring. Transform your patio with a professional exterior paint job. Paint adds color to not just your home, but to your life. Fortune Restoration is your one-stop-shop for home restoration. We are the painters in Chicago ready to help you transform your patio. We understand how paint can transform the aesthetic of your home. 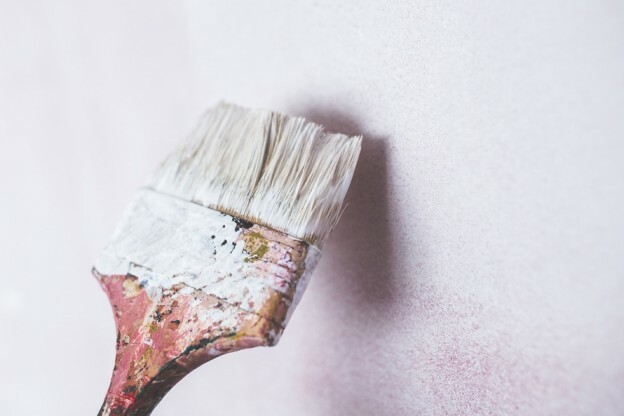 Whether you are interested in regular maintenance or a renovation project, painting is one of the most cost-effective ways to add beauty to your home. Sit back and relax while we do the heavy lifting. This entry was posted in Painting on May 15, 2017 by admin. Hiring painters in Chicago? It’s good to have a little background knowledge of the different types of paint finishes before working with a professional. 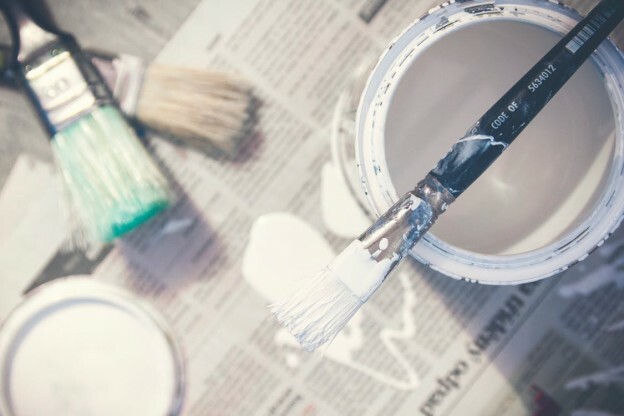 There is no need to be an absolute expert in paint types before hiring professional painters in Chicago – that is what you are hiring us for after all. However, the more knowledge you have of the different types of paint finishes there are, the better you will be able to effectively communicate to your professional painters exactly the vision you have in mind for your home. Flat Paints: Flat Paints provide a nonreflective surface quality. These paints are best suited for lower-use areas in the home or in new constructions. Flat paints help mask surfaces to make them appear smooth and uniform. Oil-Base Paints: Oil-base paints have resins and thinners in them and are best used on chalky surfaces. Eggshell & Satin Finish Paints: Eggshell & satin finish paints have a bit more sheen than flat paints and are ideal for places that will need a cleanable but not a shiny surface. Gloss & Satin: Gloss & satin are very hardwearing and are used mainly on wooden and metal surfaces. Satin is used in a similar way as a gloss but is slightly less shiny and is becoming increasingly popular. Not sure which paint finish will be best for your home project? Our team of painters in Chicago at Fortune Restoration is here to help! A few things we like to tell your customers to keep in mind is to select paint that will work will with other areas of your home, roof shingles, tiles, ceilings, stonework, pathways, and driveways. Keep in mind the style of your home and whether you will want to keep to the original color scheme. Once you have considered the above, call to make an appointment with our painters in Chicago at (847) 647-2500. We will be happy to answer any questions you may have and provide our expert opinion. We also offer free color testing so that you can be 100% sure you like a color before committing. This entry was posted in Painting on April 6, 2017 by admin. Did you know that Fortune Restoration is among the contractors with the Archdiocese of Chicago’s seal of approval for church jobs? In 1998, St. Paul the Apostle became Gurnee’s first Catholic Church. The 42,000-square-foot building was built for $5.5 million. This summer, Fortune Restoration worked under a tight deadline to restore the inside of St. Paul the Apostle Church in Gurnee. Our team has stepped aside to accommodate weekday funerals and has ensured parishioners can attend their weekend Masses starting August 15th. However, all restorations needed to be finished by Friday, September 9 in time for a wedding the next day. Restoring St. Paul the Apostle Church in Gurnee, included installing new acoustic fabric, repairing water-damaged drywall, cleaning air-conditioning vents and painting the ceiling, walls and trim. 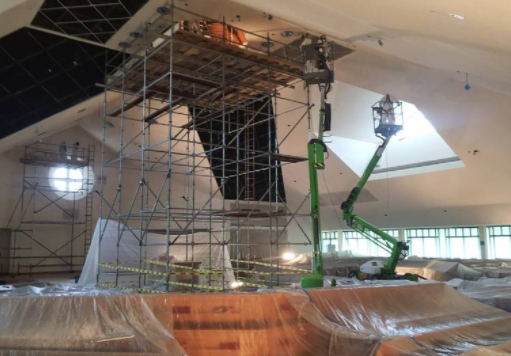 The project kicked off with crews moving all of the pews to clear space for scaffolding and lifts. Each week, pews were returned to their proper areas to accommodate for Masses on Saturday and Sunday. Rev. Gregory Houck, the church’s pastor, said that he appreciates the care workers took while working on the restoration. At Fortune Restoration, when we work on a church renovation it is unlike any other renovation. You have to treat it with respect and reverence. It is not a construction site, it is a house of worship, and our men treat it as such. The two most sacred places in a person’s life are their home and their place of worship. While we work, there is no music blaring, no lunch eaten, and no garbage is thrown out inside the church. Read the full story from the Daily Herald here. This entry was posted in Historic Landmark, Restoration on February 6, 2017 by admin. Color is a very important aspect to us personally in our homes and the places we work. Choosing a paint color for the interior or exterior of your home is a big decision that requires a lot of consideration. You want to select a color that fits your personality, works with the lighting, and compliments your home’s color scheme. Our house painting Chicago company understands how stressful choosing paint colors can be. Below is a list of 10 tips to help minimize the stress of choosing a paint color for your home! If you are like most homeowners who are house painting in Chicago, you are more than likely unsure where to begin. Experiment in a bathroom, small hall, or area between rooms. A great way to get started is by choosing a favorite color that comes from artwork, a rug, dishes, or an accessory piece as the main accent. When you choose a color, it is important that you consider the mood of the room. In a bedroom do you want it to feel soothing and restful or dramatic and intimate? Do you want your kitchen to feel sociable and stimulating or formal and soft? Soft, cool colors create a quieter feeling while stronger colors are for drama. Warmer, contrasting and brighter colors add to a sociable atmosphere. Be mindful not to overstimulate your children with intensely bright hues in the bedroom. Brighter colors lead to unrest and irritability. There is a reason why paint stores have light boxes for you to test paint chips. Natural daylight will show the truest color. Incandescent lighting will bring out warm tones and yellows. Lastly, fluorescent lighting casts a sharp blue tone. Understanding color terminology is helpful when trying to describe a color to your house painting Chicago company. Hue is what we call a color. The value of the hue is how light or dark it is. Saturation refers to how dominant the hue is. Intensity is the brilliance of the color. Consider walls as planes of color. Walk into another room in your home to see how they interact when viewing one right after another. Using a small color wheel is a great reference tool for choosing colors. It gives you the ability to modify and intensify two or more colors. You may be pleasantly surprised at how many combinations function beautifully together. When you hire a house painting Chicago company such as Fortune Restoration, you are in the hands of the experts. 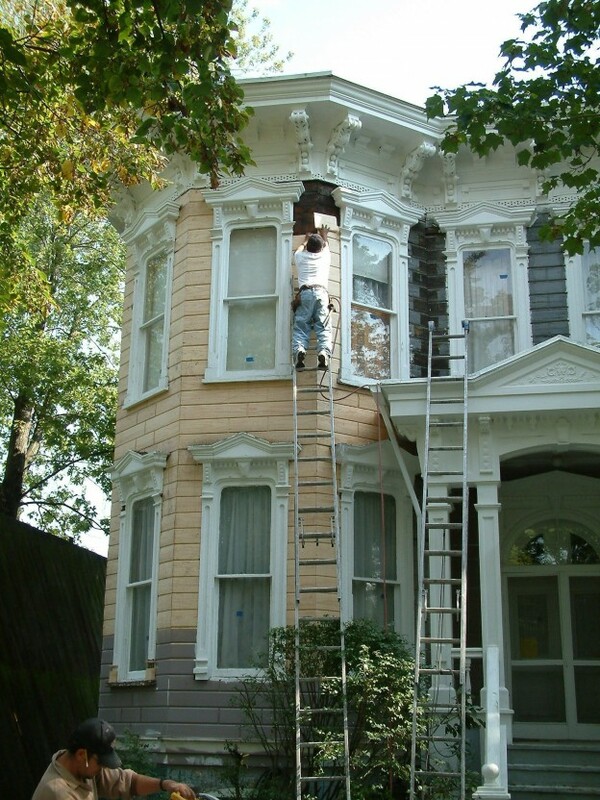 Fortune Restoration has been a trusted professional painting company in Chicago for over 25 years. We are full-service painting contractors and have the ability to accommodate large and small projects for your home or business. We offer color testing so you can find the color that is best for you. Request your estimate today! This entry was posted in Painting on October 18, 2016 by admin. Rust: There should never be rust in your firebox or damper. When rust is visible this is a sign of excess moisture in your chimney. If there is enough moisture in your chimney to cause visible signs of rusting, there may also be serious damage such as, cracked flue tiles. Leaks: A leaky chimney is a huge red flag! We have had no shortage of rain this summer, and if you’ve noticed dripping water around your chimney, it is very likely that your chimney has become damaged. Spalling bricks: If you begin to notice flaking, peeling or crumbling bricks on your chimney, it is a sign of serious damage. There are also instances where you may notice entire bricks of your chimney popping out of place. If this occurs you may need invest in structural chimney repairs with a brick repair Chicago company. Cracked chimney crown: The purpose of your chimney crown is to protect the bricks from water penetration and damage. If your chimney crown is showing cracks or damage, water will seep into the chimney. Your chimney crown is the first defense against water damage. 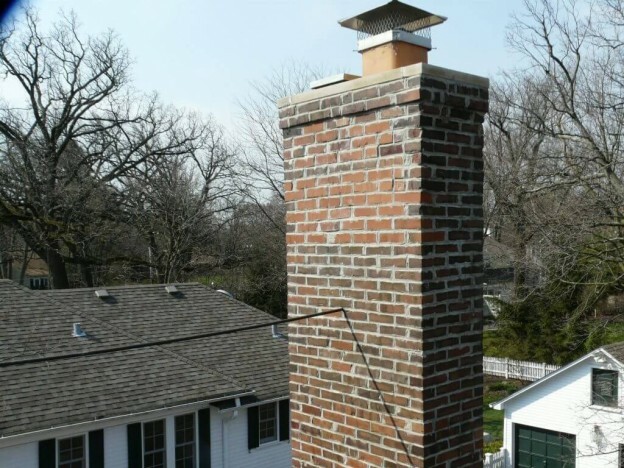 It is vital that your chimney crown is in top shape for the winter and spring! Deteriorating or cracked mortar joints: When the mortar deteriorates, your masonry is exposed to more moisture which will accelerate the deterioration of the chimney as a whole. When temperatures drop, the added moisture can freeze the inside cracks in the masonry. 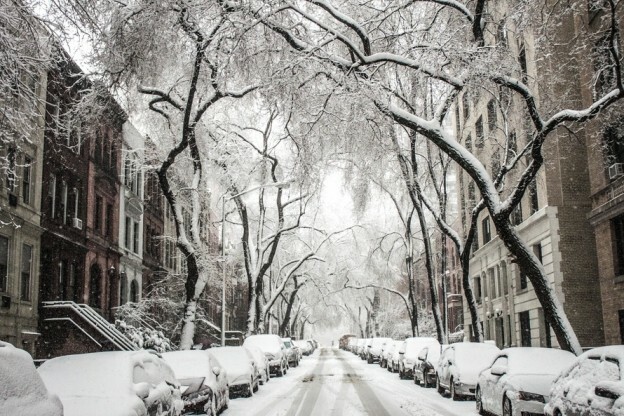 When the moisture freezes and thaws in cracks larger cracks can develop. It is important that you contact a brick repair company in Chicago immediately to preserve your chimney from further damage. Shalling: If you begin to notice flakes of chimney tile accumulating in your fireplace, you need to have your chimney liner replaced as soon as possible. An un-fixed chimney liner can cause a dangerous house fire. If your home is showing any of the above signs, you are in need of chimney repairs. Our expert team at Fortune Restoration has the knowledge to help take care of everything from brick replacement to a complete chimney rebuild. Contact us today for your free estimate! Masonry is an investment; as durable and long-lasting as masonry is, it still requires routine cleaning and maintenance. Over time, dirt and grime will build up. Cleaning is an inexpensive way to spruce up the exterior of your home. Improper cleaning, however, could negatively impact your finances. Hiring a qualified masonry contractor in Chicago to provide chemical cleaning services, could make the difference between beautifying or harming your stone. Professional masonry contractors will provide the proper chemical mixture compositions for cleaning masonry. The effects of chemically cleaning your stone and masonry can be dramatic but should be done with proper care. Fortune Restoration’s expert masonry team will work as gently and diligently as possible to protect your masonry. 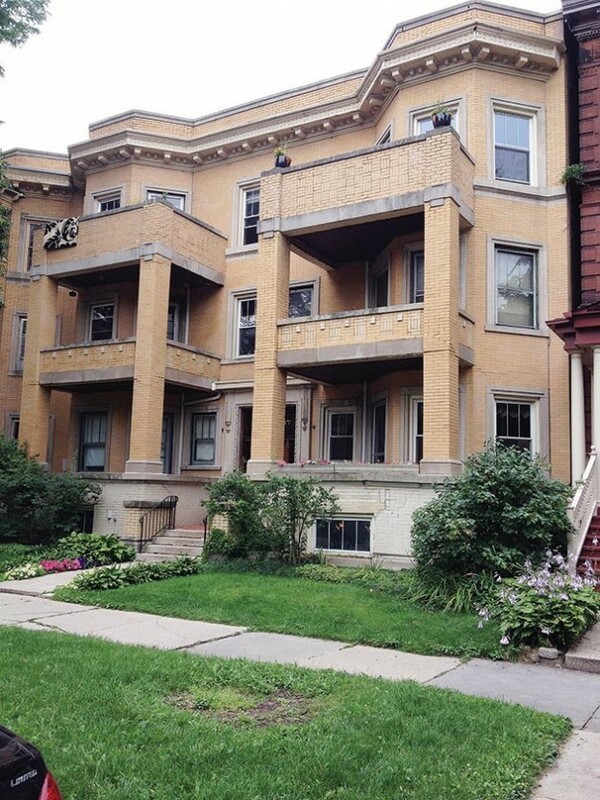 Fortune Restoration have been trusted masonry contractors in Chicago for decades. Fortune Restoration is able to provide you with a same day quote for all of your masonry needs. Often times, people believe a DIY masonry cleaning will save them money and time. A mistake that is often made by people who are not experts in masonry, is to use the same methods their masonry as their concrete or stone. Using muriatic acid or sandblasting will both etch and damage the brick and mortar. This method will irreversibly change its appearance, resulting in a DIY project that will cost more financial harm than good. If you do decide that a DIY masonry cleaning is for you, make sure that you test your cleaning solution on your masonry in an inconspicuous area before cleaning. Make sure you rinse the area you tested and give it time to dry before you decide you are going to clean all of your masonry using this product. Apply water to the masonry before you begin to apply chemicals. In order for the chemicals to soak into the brick and stains, it will need to be wet. When you are applying the chemicals start at the top and move down the wall with as little pressure as possible. It is crucial when rinsing that you wash off ALL the chemical cleaning products. The chemicals that soaked into your brick should be washed off using a high power pressure washer. The best way to clean your masonry is by hiring a masonry contractor in Chicago. Avoid DIY chemical cleaning that will hurt you financially. 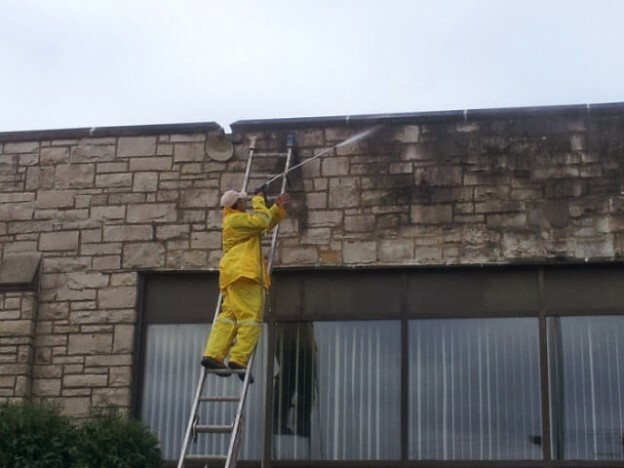 Trust that the professionals at Fortune Restoration, who have been cleaning masonry for decades, will get the job done correctly the first time!